The northern Gulf of Mexico coastal region is vulnerable to a variety of natural hazards, many of which are linked to climate and climate variability. Hurricanes, which are one such climate-related hazard, are a major recurring problem, and the active hurricane seasons of 2004 and 2005 raised interest in better understanding the controls and risks of hurricanes. Examination of historical records reveals intervals of alternating low and high hurricane activity that appear to be related to changes in average sea-surface temperature in the North Atlantic Ocean. Analyses of instrumental temperature records from the North Atlantic show decadal-scale oscillations of slightly higher versus slightly lower average temperature extending back in time for over 100 years. This oscillation is known as the Atlantic Multidecadal Oscillation (AMO). 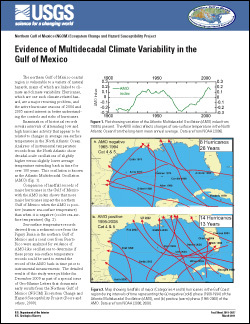 Poore, R.Z., and Brock, J.C., 2011, Evidence of multidecadal climate variability in the Gulf of Mexico: U.S. Geological Survey Fact Sheet 2011–3027, 2 p.